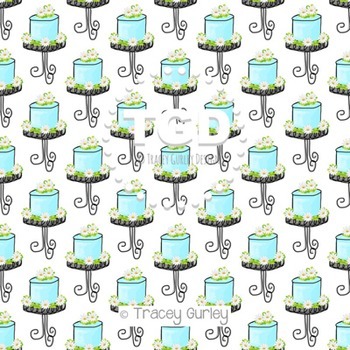 Turquoise Daisy Cake Digital Paper original art by Tracey Gurley. I painted/illustrated each element in this pattern. Perfect for planner pages, calendars, parties, invitations, decorations, and scrapbooking!! You MAY use my designs for YOUR PERSONAL classroom use, creative projects, etc. You MAY use my graphics to create your own items to sell digitally on TPT or on other sites as long as it is combined with your work to create new works. The files you sell digitally must be flattened. Please give graphics credit to Tracey Gurley Designs. YOU MAY NOT share, resell, or redistribute any of my artwork and you may not claim it as your own. This also means that you may not add my images to other clip art kits or digital collections, etc. All copyrights remain with Tracey Gurley Designs. This is a digital product, therefore no physical product will be sent. Once payment is received, your purchased digital files will be available for download in your TPT account. Downloaded files are non refundable.